The dongle supports data transfer rates upto 115.2 Kbps and requires iOS 5.0.x or above on all iOS devices that have the lightning port. The dongle is not compatible with older generation iOS hardware that has a old 30 pin charging port. Field firmware update. We are constantly working on new and improved functionality. Over The Air updates will be made available as new firmware functionality is released. Connect field sensors like Underground Cable Locators, Lasers, Resistographs etc simultaneously with your GPS/GNSS equipment. Long Range Bluetooth - over 100M operating range between Dongle and iPad. Free NTRIP/RTK client app for iOS to allow you to use your device's internet connection to provide RTK corrections to the connected GPS unit. At least 10 hours of continuous use on a single charge using internal battery and an option to plug in a standard micro USB into the charge port for extended periods of operation if needed. Ready for use in your environment - IP67 rated. Jailbreak Free solution to use external GPS with your iOS device. No Custom development needed to consume accurate location from your external receiver in your existing apps. GPS Unit must emit GPGGA and GPRMC sentences once a second. Any other sentences as needed can be emitted by the GPS device. Though not required, we recommend GST, GSA, GSV, VTG, ZDA sentences be turned ON, on your GPS device. 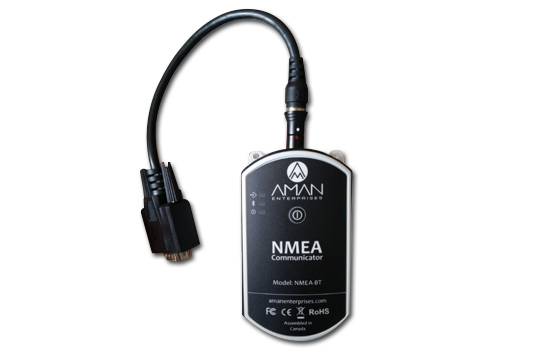 NMEA-BT supports baud rates up to 115200. Baud Rate on the NMEA-BT device must match the baud rate of the GPS unit’s serial port. Baud rate of the NMEA-BT can be configured using the GPS Cable app available from Apple iTunes app store. 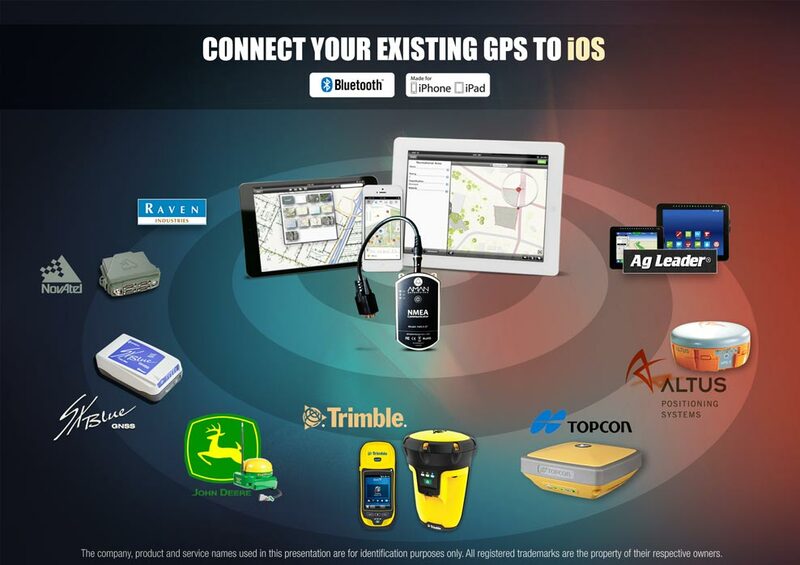 Connect Trimble Pro 6 series GPS receivers to iOS Devices – iPhone, iPad. Connect Trimble GeoExplorer series GPS units to iOS Devices – iPhone, iPad. Connect Topcon HiPer SR series GPS receivers to iOS Devices – iPhone, iPad. Connect Altus APS Series GPS receivers to iOS Devices – iPhone, iPad. Connect Geneq SXBlue GPS series receivers to iOS Devices – iPhone, iPad. In addition to Increasing the Location Accuracy of all native applications running on iOS, this solution can be used in conjunction with your custom apps to allow you to get access to low level fine grained data parameters associated with your incoming location data. Developers of these custom apps are requested to contact us so we can white-list your app with our hardware solutions with Apple prior to submitting your app for review on the iTunes App Store.